On the heels of the 76ers’ breakout season coming to an end in the Eastern Conference Semifinals, we’ll be spending a few days publishing short stories as part of our “Looking Ahead” content series, which will focus on how the team, and its players, can build off the eye-opening success they enjoyed in 2017-2018. If there’s anyone out there who best understands the intended meaning of the “More to Do” mantra the 76ers adopted during their 2018 playoff run, it would have to be the guy who made the slogan vogue, right? That person, of course, is Sixers’ head man Brett Brown. With an approach that is as consistently demanding as it is inspiring, the 56-year old South Portland, Maine native led the franchise on one of its finest runs dating back to the 1982-1983 championship campaign. The Sixers set a club record with a 24-win improvement, surpassed the 50-win plateau for the first time since the 1980s, established a new NBA mark by closing the regular season on a 16-game winning streak, and won a playoff series for just the third time since their march to the Finals in 2001. On top of that, the prized, young blue-chip talent entrusted in Brown’s stead continued to progress in encouraging fashion - the latter phrase being one that, in all truthfulness, probably undersells the job Brown and his staff have done. Joel Embiid? It took the 7-foot powerhouse fewer than 65 total games played in his career to impress the masses enough to not only earn himself an All-Star Game bid, but a starting nod. Prior to Embiid, the no. 3 selection in the 2014 draft, the last Sixer named an All-Star starter was Allen Iverson, in 2010. Embiid also landed a spot on the league’s All-Defensive Second-Team. Ben Simmons? After the 2016 top pick was forced to sit out a year due to injury, his debut season didn’t disappoint, as he flourished in the starting point guard role that Brown originally envisioned him filling. The Aussie proceeded to take the league by storm, joining Naismith Memorial Basketball Hall of Famer Oscar Robertson as the only players all-time to average 15.8 points, 8.1 rebounds, and 8.2 assists per game (5th NBA) as rookies. Simmons deservedly earned votes for All-Defensive First-Team honors, having finished the year eighth in the league with 1.7 steals per game, 10th with 226 deflections, and second with 145 loose balls recovered. He is a finalist for Rookie of the Year, and was a unanimous choice for All-Rookie First-Team. Beyond Embiid and Simmons, all it takes is a simple, individual comparative scan down the rest of the Sixers’ roster to find the fruits of Brown’s development handiwork. 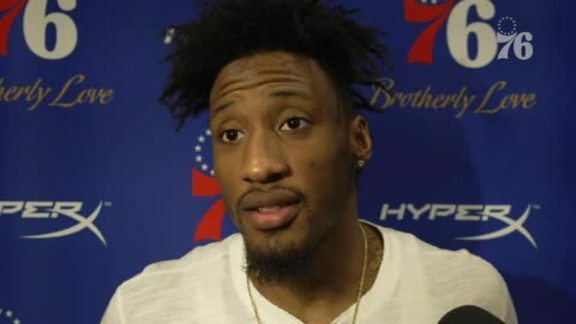 Robert Covington, the “poster child” for the Sixers’ player development program the last half decade, as Brown sometimes refers to the small forward, is now a All-Defensive First-Teamer. Proving to be far more valuable than a complementary piece in a bolstered starting line-up, Dario Saric improved his net rating dramatically from year one to year two (-7.2 netrtg to 6.7 netrtg), and made good on his pledge to sharpen his 3-point shooting (his efficiency skyrocketed from 31.1% to 39.3%). T.J. McConnell, like a kindred spirit of sorts to Brown, got better. Again. Even Markelle Fultz, given by Brown a strict regimen for mental and on-court reps during his time on the sideline, surfaced late in the season, and showed promise. When it came to working in key veteran free agent additions acquired in free agency and from the buyout market, Brown made the integrations seem about as seamless as possible. By regular season’s end, the Sixers were a top-3 defense, fifth in pace, and tied for eighth in 3-point efficiency. In the defense, pace, and space departments, the Sixers were excellent in all three areas, which form the primary pillars of Brown’s scheme. For as much as Colangelo, whose partnership with Brown began in April of 2016 when Colangelo was hired as President of Basketball Operations, praised Brown, Brown himself acknowledged that, similar to the players he coaches, there were things for him to learn and grow from on the heels of the Sixers’ second-round exit from the Playoffs. In other words, there is more to be done. At his May 10th end-of-season press conference, Brown introduced the notion that this spring served a refresher course for him in the “real time gameplanning, the real time landscape of playoff basketball.” Despite reaching the post-season 12 times in as many years as an assistant in San Antonio, those days are well in the rearview. “You’re reminded of playoff basketball again,” was how he put it. As for regrets, yes, Brown said he had a few. He acknowledged that if he had to do it over again, in hindsight, maybe he would have handled the end of the first half of Game 2 in the Eastern Conference Semifinals differently, or tweaked his rotations earlier in the series. Brown also would have liked to see the Sixers defend the perimeter better against Boston, which shot 37.3 percent in the second round. During the regular season, the Sixers held opponents to 34.2 percent shooting on threes, good for second in the NBA. In the highly-scrutinized, highly-pressured professional word in which his trade is plied, Brown understands that second-guessing, both internal and external, is a natural, common thing. Still, only a few days removed from being eliminated by the Celtics in Round Two, Brown wouldn’t allow the fresh sting of defeat to cloud perspective. And he shouldn’t have, given what he and the Sixers achieved in 2017-2018. After that news conference - who knows, probably even before it - Brown’s mindset started shifting increasingly towards the future, and what he and the Sixers hope to accomplish during an important summer. Adding more talent is on the top of the organization’s to-do list. Helping change the feel around the Sixers has been as much a part of Brown’s legacy as anything else. That said, he’s done well in the “everything else” realm, too.